In a stunning video recorded at the University of Tennessee, Knoxville campus, a college student arguing for abortion explains why infanticide, the killing of a two-year-old in this case, would be perfectly okay. There's "no difference" between killing a tree and a two-year-old child, since, according to the student, both the tree and the child are unable to communicate like an adult and therefore lack sentience. 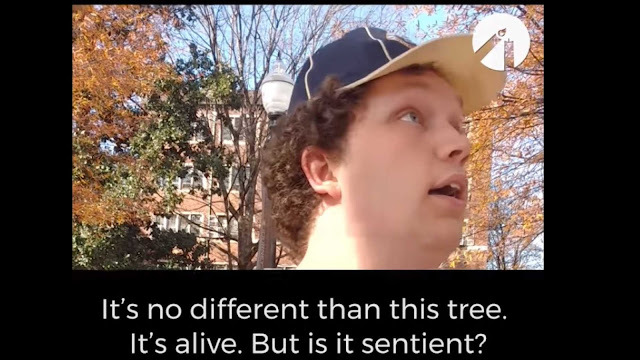 "The fact of the matter is, if without communication, we have no way of knowing if you’re sentient or not," the student said on video, which was filmed by Brenna Lewis, the Students for Life of America’s Appalachian Regional Coordinator. "I mean, it’s no different than this tree. It’s alive. But is it sentient?" "To compare with a two-year-old is kinda tough," Lewis pushed back. His response, predictably, was utter nonsense. "Okay, can the two-year-old talk to me?" he asked, twice. "In some instance, I'm fairly certain that is. But generally speaking, the child still has the inability to communicate. And until we determine that as such, at what point does sentience become an issue, we can't really debate whether or not that is the situation or not." Many abortion advocates believe that children who survive botched abortions should be left to die. In 2013, for example, a Planned Parenthood lobbyist openly endorsed "post-birth abortion." Kristan Hawkins, president of Students for Life of America, argues that it's this sort of extremist position that is actually pushing more people to join the pro-life movement. "When Planned Parenthood consistently opposes even common-sense regulations, such as prohibiting Down syndrome abortions, we should not be surprised that people are increasingly joining the pro-life movement," she said.